Krav Maga has been successfully used to train law enforcement officers and undercover agents since the 1940s. Over the decades since, Eyal Yanilov has worked to pass this knowledge on to Law Enforcement units such as SWAT teams, air marshals and intelligence agencies around the globe. Today, Eyal and KMG’s Global Team regularly conduct elite specialist courses for various law enforcement agencies around the world, customized to meet the specific requirements of the unit and country in which they serve. Why Should Law Enforcement Units Train KMG Krav Maga? KMG Krav Maga is a efficient, effective, tactical system that is easy to learn, easy to retain, and realistic to perform under stress. Our system was developed based on decades of experience training law enforcement units, as well as real experience on the job. Our Global Team includes Law Enforcement specialists who have actively served in their respective countries, and were also key actors in the development of Krav Maga over the last 25 years. The KMG Krav Maga system combines instinct-based self-defense and fighting techniques with efficient tactics, training methods and drills. KMG offers a strong curriculum that teaches and develops courage, controlled aggression and determination, fighting spirit and combat mindset, situational awareness, as well as avoidance, prevention tactics and verbal de-escalation to defuse or prevent conflict situations whenever possible. CQB, Armed and Unarmed Hand-to-Hand Combat. The officer learns how to defeat an opponent quickly and effectively. This involves different elements of a fight: tactics, techniques, and fighter mentality. Combat involves both unarmed techniques as well as use of tools (i.e. knives, sticks, guns, etc.) for all techniques. Self-Defense Techniques. Krav Maga self-defense techniques enable the practitioner to effectively defend himself against both armed and unarmed attackers. These techniques are practiced under stress, including simulations of adverse conditions and environments (i.e. in the dark, on the ground, in situations that limit the practitioner’s movement), as well as with or without tools or weapons on hand. Third Party Protection. This includes defending a third party (i.e. VIP, fellow officer, civilian, etc.) against all kinds of armed or unarmed attacks and threats. Training covers dealing with one or more attackers; moving, evacuating and taking care of the other person; and functioning under different conditions and environments, and with or without tools or weapons. KMG’s integrated approach is direct and specific for law enforcement, as has proven results over the years in dozens of countries worldwide. KMG avoids instructional methods which train officers to be either sport fighters or mere operators of equipment. We prepare them for a variety of realistic situations and problems, honing their situational reactions, technical and tactical skills, problem-solving abilities, and decision-making skills. 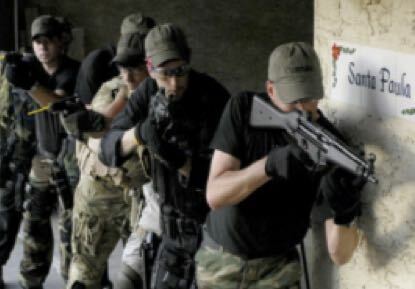 KMG conducts seminars and specifically tailored courses for Law Enforcement agencies, which includes relevant Krav Maga techniques and tactics for apprehending and controlling suspects, shooting range training for both non-lethal and lethal-force, and scenario and CQB training sessions. With this combination of indoor and outdoor drilling, simulation and stress training, and technical work, participants are elevated to the highest possible level – mentally, physically, technically and tactically. In addition to regular Law Enforcement duties, members of Special Weapons and Tactics (SWAT) units have to deal with situations like hostage rescue, high-risk arrests, and serving of warrants in environments that requires a higher level of training, experience and mental preparedness. At KMG, we believe that correct and challenging training saves lives out in the field. This is why we put emphasis on simple but effective solutions based on common threats presented to different units. KMG Krav Maga solutions capitalize on gross motor skills coupled with technical and tactical proficiency to give officers the best chance of operational success. KMG conducts general and specific SWAT courses around the world according to a unit's specific needs and tasks. Courses are provided only to active units. If you would like to request this training for your unit, please contact us using the form below. The Department of Homeland Security (DHS) of the United States has stated: “The Air Marshal Service is designed to promote confidence in civil aviation by effectively deploying federal air marshals (FAMs) to detect, deter, and defeat hostile acts targeting the United States.” On many high-risk routes going in and out of specific regions and countries across the world, Air Marshals are embedded among the passengers. The Air Marshal course specifically deals with physical confrontations that might arise before, during or after transit on an airplane. The natural limitations of movement onboard an airplane makes it necessary to change ones tactical behavior and adapt to the confined spaces that are available. The course deals with unruly passengers, threats, attacks, and hostage and hijack situations. Air Marshal courses are provided only to active units. If you would like to request this training for your unit, please contact us using the form below. KMG has worked with intelligence officers in major countries around the world. These officers have a specific need for hand-to-hand combatives to deal with problems and challenges faced during missions. Information for intelligence agency training is strictly provided only by agency request. Please contact us if you require more information. Krav Maga was created by Imi Lichtenfeld (1910-1998), an Israeli Grand-master who founded it in the late 1940s while serving as Chief Instructor for hand-to-hand combat and combat fitness training for the Israeli Defense Forces. Because Krav Maga is designed to be a practical system of self-defense and fighting, it does not contain traditional or sporting elements. Instead, Krav Maga focuses on how to avoid, prevent, deter, deal with, and ultimately escape all types of violent confrontations. KMG’s Krav Maga system was developed through scientific methodology and actual field experience into an instinct-based self-defense and fighting techniques with designated tactics and drills. KMG offers a strong curriculum that teaches controlled aggression, fighting spirit, situational awareness, as well as avoidance, prevention tactics and verbal de-escalation of conflict, whenever the need and the possibility arises. Implementing Krav Maga as a full-scale system for a unit or an organization is a straightforward process, but one that requires planning for proper integration. The strength of KMG is that we have a Global Team of Instructors with extensive backgrounds in both service and training of law enforcement, security and VIP protection, and military and special forces. They come with decades of knowledge and experience in integrating Krav Maga into a unit's training methodology and systems, ensuring the most effective outcomes in the field. To introduce Krav Maga to your unit, contact our using the form below. Tell us your unit's location, number of personnel, and training requirements so that our professional services representative can get back to you with the best option for your organization. All information provided in this form is treated as confidential client information. You may also choose to directly email us at info@kmgchina.cn with the information below. Please state your requirements specifically so we can respond to you properly and in a timely manner. Please also provide us with your unit's information, such as number of personnel, location, and any other operational information we may need to design a training program for you.